While all you do is make popcorn, you do need to be fast. You have one minute, so you need to do a lot of tapping, and it has to be precise. Wait for the corn to become a full popcorn and then you have to tap again to clear. The mechanics are easy to learn, but mastering it will take time and you also have to be good at tapping to get the high scores. And while Pop the Corn is basically all about tapping, there’s a bit of strategy needed here as well. Remember that popcorn becomes stale when it is kept too long in the pot. You can tell this is the case when your golden brown popcorn slowly turns gray and then eventually turns into an ugly black. To score those all important points you need to clear / eat those golden popcorn in rows, as that will earn you big scores. 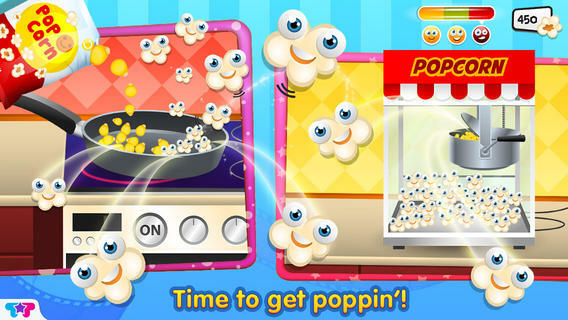 In addition to the usual way of clearing you can also avail of popcorn bombs to clear the remaining popcorn, and there are also popcorns that will stop the time so you can score more points.